Wet stamp verso print: "Man Ray / 31bis...Paris". Verso print in pencil: "Peignot". 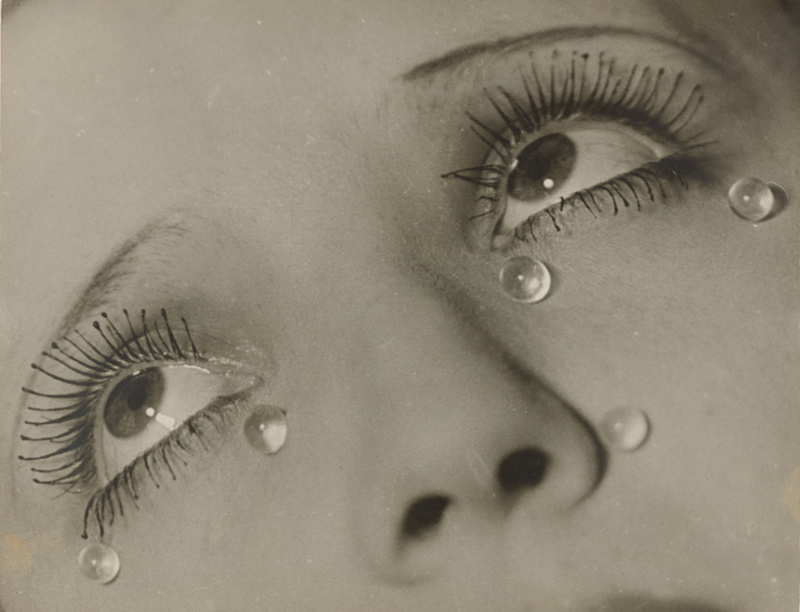 Judging from his inclusion of this image in other photographic compositions, Man Ray must have considered Tears one of his most successful photographs. A cropped version of it with a single eye also appears as the first plate in a 1934 book of his photographs. Like the emotive expression of a silent screen star in a film still, the woman's plaintive upward glance and mascara-encrusted lashes seem intended to invoke wonder at the cause of her distress. The face belongs to a fashion model who cries tears of glistening, round glass beads; the effect is to aestheticize the sentiment her tears would normally express. Man Ray made this photograph in Paris around the time of his breakup with his lover Lee Miller, and the woman's false tears may relate to that event in the artist's life. Daniel Wolf, Inc., sold to the J. Paul Getty Museum, 1984. Krauss, Rosalind E. and Jane Livingston. L'Amour Fou: Photography and Surrealism (Washington, D.C.: Corcoran Gallery of Art; New York: Abbeville Press, 1985), p. 118. Pech, Jürgen, Achim Sommer, and Patrick Blümel. Man Ray: Fotograf Im Paris Der Surrealisten. (Brühl: Max Ernst Museum des LVR, 2013), p. 165. Brown, Bill. Other Things (Chicago: The University of Chicago Press, 2015), plate 8.